I’ve been fuddling about with a little bit of shisha embroidery lately. Remember this project that I showed you recently, featuring shisha and beads? Well, one of my biggest beefs with working shisha is that it’s difficult to acquire tiny shisha mirrors that are affordable and relatively easy to work with. Not sequins, mind you (they have a hole in the middle), but little flat mirrors. The smallest sized mirrors that are commonly available for shisha embroidery are about 1/2″ round and larger. If you’re embroidering something small, or if you just want a little bit of the sparkle, flash and zing that comes with shisha work, you have to get inventive. As I pondered the question of small mirrors and surveyed my supplies, an idea struck me. It resulted in a nicely tiny little shisha blob. Oh, I was so happy! Really, it wasn’t that inventive. I started with scissors and then finally progressed to that Wonder Tool that never gets enough credit: the single hole punch. The key here is the mylar “mirror” sold for shisha embroidery. These aren’t really mirrors. They’re plastic, thin disks that are very light, inexpensive, and flashy. They’re shiny like a mirror, but there’s not much height to them, and no weight at all. Unlike glass mirrors, mylar mirrors can be easily cut with craft scissors (probably not a task for your embroidery scissors). But it’s hard to get a uniform size. I wanted about 1/4″ disk. And that’s when I thought of the single hole punch, which makes perfect 1/4″ disks out of paper. Why wouldn’t it work with mylar? Oh yes, it does work! Out of 3/8″ mylar disks, I can punch four tiny mylar mirrors. Success! Now, if you have any issues with low hand strength, arthritis, or carpel tunnel, this might not be the exercise for you. Ask someone else to do the punching, because it isn’t easy. If you stand up, put one arm of the single hole punch on the table, and push on the other arm, using body weight, it might work. But it’s pretty difficult to squeeze the punch with your hands and cut through the mylar. 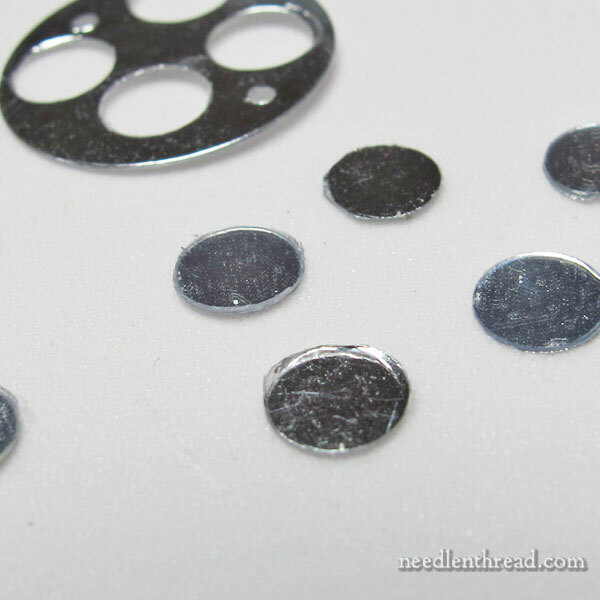 You’ll end up with small punch-ridges around the edges of the punched disks. Just make sure the ridge side is turned down towards the fabric, so that the thread isn’t rubbing over it as you stitch. You can also trim off any excessive shards, but for the most part, the cuts are clean enough. These disks turned out just exactly the size I needle for a little sample project I’ll be working on today, and that I plan to finish today, which means I won’t finish it until tomorrow or the next day. I’ll show it to you when-if it works out! If you want to go with authentic tiny mirrors (called “mica” or “mica mirrors”), Silken Strands in the UK is the only place I know of that offers small mica mirrors that are used in authentic shisha. Though they’re the real deal, the mica mirrors are more difficult to work with. They require buffing and sanding, or your threads get eaten alive. They’re generally very irregular in shape, which is normally ok, because that’s part of the authentic look. But the irregular shape makes it more difficult to stitch around for beginners. But if you’re looking for authentic mica mirrors, Silken Strands is the place to look. I don’t know of any supplier in the US, though there are several shops that carry the craft mirrors that are often substituted. Craft mirrors don’t require sanding, they’re regular in shape, but they’re significantly thicker than mica mirrors, larger in general, and heavier. Shisha Fly Stitch / Backstitch Variation – this tutorial for a shisha variation involves fly stitch and backstitch for the decoration, for fantastically splashy, two-colored shisha. I’ll show you how I get on (or don’t get on) with my current experimental sample that incorporates shisha! In the meantime, if you have any questions, comments, or suggestions, feel free to chime in below! I used the same method when I did a Long Dog sampler that needed copper paillettes along with the standard gold ones. An ice pick to the center added the stitching hole. It worked great, and even looked close enough to the gold machine made one not to be noticed! What about making a shiny button using a covered button form and the mylar side of a potato chip bag? They are pretty indestructible. Probably too fiddly to use without a stiff backing or form. Maybe a gathered yo-yo circle around a button and stitched on upside down? My mind wanders; no time to try out all my wild haired ideas. I looked around for interesting traditional Shisha work during the two years I spent in India (I just got back late last summer). The majority of what I found in the markets used bits of sparkly CDs, circles of mylar from balloons, or pieces cut from the shiny side of chip bags. The latter two were often stretched over circles cut from cardboard or aluminum cans. Sometimes the aluminum can was used without the extra shiny cover. Mica mirrors were only in antique pieces – embroideries of 50+ years ago. Even the modern mirrors you write about here were exceedingly rare compared to the scrounged materials. I am sure there were better pieces out there, but in tourist trade, bad drives out good. I’ve done this so many times for costumes, and also for a ridiculously large book cover series…I use the big ol’ lever hole punch, which is made for punching through heavier materials and thicker layers of paper. Before that, I had to wear heavy, leather gloves and hit the hand-held punch with a mallet. Too much aggravation for something I do often enough that I should have purchased better equipment in the first place! Very inventive! I’ll bet you danced around the room when it worked the first time :). When I came home today from my volunteer work at the Fair Trade shop, I was greeted by a parcel from my parents containing one half of an old pair of traditional braces, an old note pad from Güttermann and a goldwork and bead purse, probably from the ArtDeco period. It was like Christmas! So nice when parents do the leg work around yard sales! If you were doing a lot of these, you might want to invest in a heavy duty hole punch. I have one I use at work and it’s amazing how strong it is. We use it to go through multiple layers of cardstock. The one we have is Sargent 1406S Heavy Duty Hole Punch. I have no idea how much they run and have no relationship with the company. Just wanted to share. Love your blog. It’s the highlight of my day. 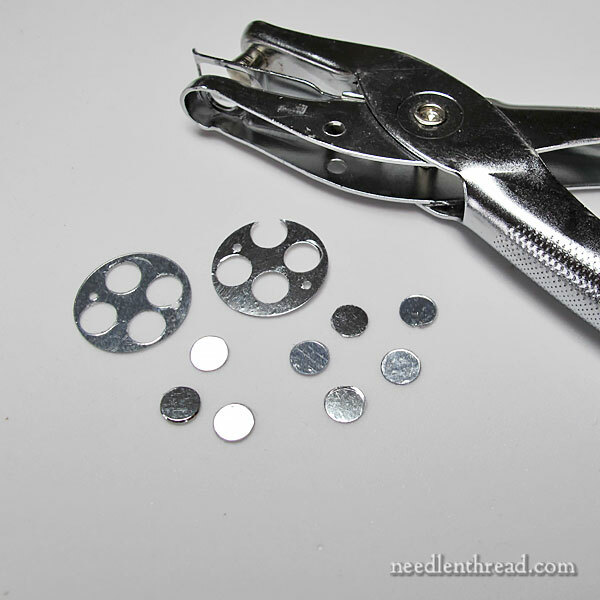 Hole punches (available in different sizes and shapes) are also great for beetle wings. Just steam the wings and punch them out. 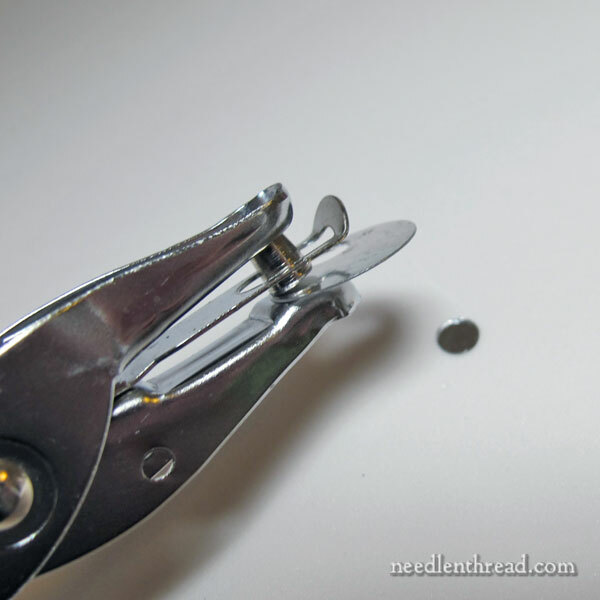 You can make a little hole in them with a needle if you want beetle wing sequins. I think “fuddling” is a great word. It suits what I do much of the time! The advantage to the Mylar disks is that they can be washed – as can glass, other plastics, etc., if you’re making something that may need laundering. If you’re not, of course it wouldn’t matter. But if you are, anything on a paper foundation isn’t going to work. 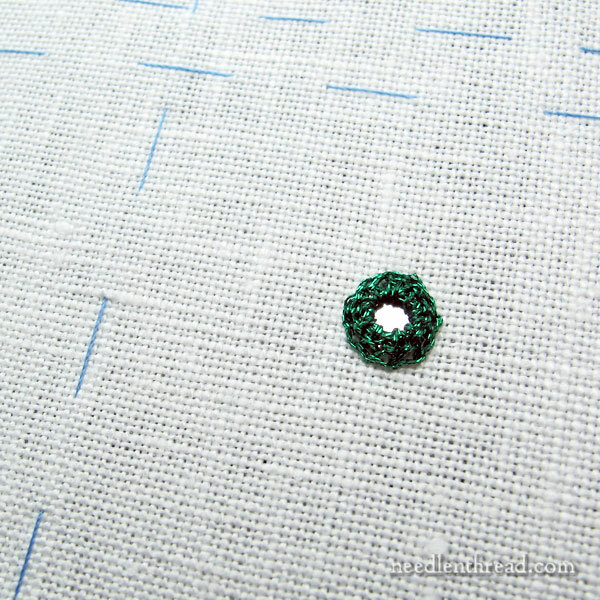 I was searching for small flower sequins for use in crazy quilting, and found the perfect tiny punch, large paillettes (the hole in them is near the edge) and even 3 x 5 sheets of “sequin material” at the craft store. I’ve been meaning to play with using a round punch to try shisha, but a large paillette yielded several 1/4″ flowers that were relatively easy to punch so round ones will be a cinch, too! I too have used cut-outs from paillettes. I even used one to make a gold ‘pear’ by cutting the shape for a partridge in a pear tree embroidery/collage. Late today I’ve been to the Tower of London it was great but extremely busy. Anyway I do love your inventions and the mica shish mirrors are great for small projects. I still haven’t tried Shisha embroidery but it will certainly be incorporated into my lace journal, which I think will look great with these small mica mirrors. Maybe I will invest in mica shisha mirrors as these would be more appropriate for the journal. Thanks for the tips on how to achieve mica mirrors and for the link to Silken Strands in the UK, it’s good to know I can buy them locally. Thanks also for the links on Shisha embroidery very useful. I look forward to your progress on the project. Thank you for this, Mary! My Bleuette size (11″ tall” Solange (Heubach 342) is asking for a flashy sari and bells on her ankles — for Halloween! I hope you’re wearing safety glasses! Seriously, I have a stack of CD’s ready to recycle. They are SO pretty, I keep thinking what could I do with them? . . . holiday decorations, curtain for doorway? And of course shisha. I have no input, expertise or muscle power from a Man! If men used shisha, they would think of a good way. The thickness stops me. For something like this I highly recommend the Swingline Low-Force hole punch. It’s handheld for better precision, affordable at around $7, and a savior on my hands. I picked it up on Amazon for heavy business cards, and I can punch three at a time with no problems. Anyways, I love this! Fantastic idea. Check out the hand punches for scrapbooking. There are some designed to be leaned on. I wonder if Mylar ribbon would be stiff enough? Maybe a dab of water soluble glue would hold it in place? I think you will like the blog Kate Davies. She just got married and make or had made the brides and grooms attire. I thought it was so beautiful. I would love to go to Scotland soe day. I love your website too. A fan of yours and kates. Hi Mary,in India we get this mylar mirror very easily. .Am so glad that u have started a mirror work project. they are the tiniest am using. MARY, I FOUND MY TIDDLY WINKS GAME, BEST USE SHISHA MIRRORS AND WINKS IN COLORS. This sounds like a great idea but after Googling madly I failed to find anything like your discs. Can you tell us where to find these please Mary? Even if I don’t have the strength to use the hole punch I am sure my inventive husband will come up with something.